NEW: Quiet Please, Owen McPhee! Talking can prove a point, but listening can open your heart. Owen McPhee doesn’t like to talk, he LOVES to talk. He spends every waking minute chattering away at his teachers, his classmates, his parents, his dog, and even himself. But all that talking can get in the way of listening. And when Owen wakes up with a bad case of laryngitis, it gives him a much-needed opportunity to hear what others have to say. 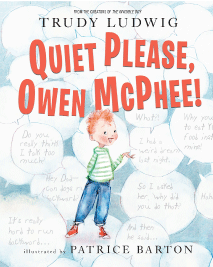 From the author-illustrator team behind The Invisible Boy, Quiet Please, Owen McPhee! helps young readers to understand the importance of listening—not only with your ears but also with your heart. Available July 2018 wherever books are sold.